Wish to try something new to lift up your eyes this season? Then, you are at the right place! 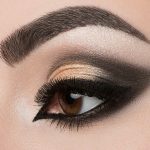 We bring to you a stunning and dramatic eye makeup look, which will bring out the beauty of your eyes in the best possible way. Follow this tutorial to learn the step by step illustration of the dramatic cut crease Arabic eye makeup. The cut crease Arabic eye makeup focuses on two key elements – bold and dramatic eye makeup with subtle lips and face makeup. You can recreate this makeup look by just following the step by step tutorial mentioned below. Start with clean and fresh eyes. Apply a good eye cream to hydrate the delicate eye area. Here, I have used the Banjara’s Almond Under Eye Cream. Conceal all your dark circles with a heavy duty concealer. This step will lift your eye makeup and help provide a stronger definition to your eyes. I have used the Kryolan Derma Camouflage Concealer to hide and lighten my dark circles. Let’s start the eye makeup. 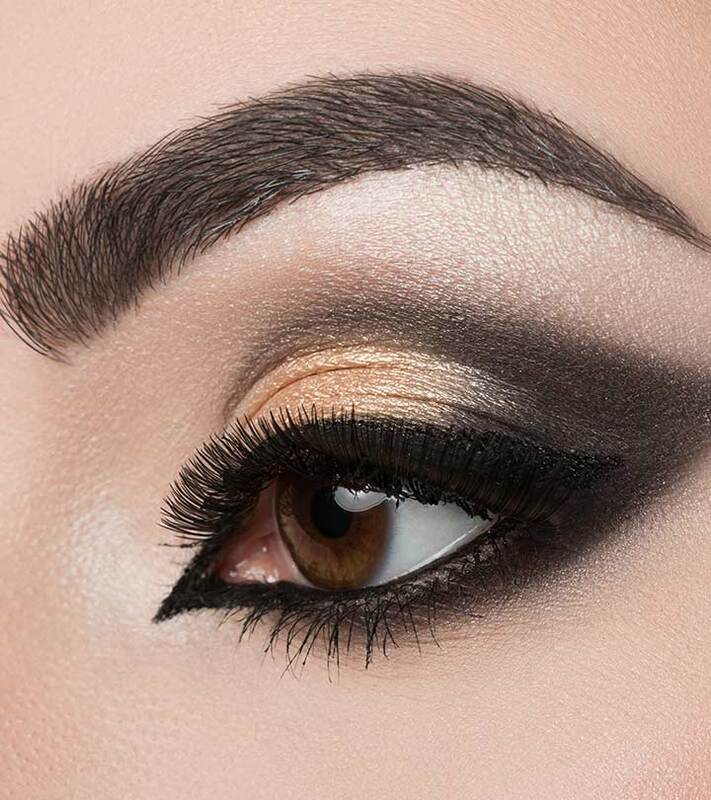 Use a thin pointed eye liner brush for creating an intense cut crease look. I have used the Audrey’s Eyeliner brush as it is very fine and pointed for drawing neat and precise lines. Start by drawing a line by following the natural crease of your eyes. If you keep your eyes open, you could easily locate the crease area. 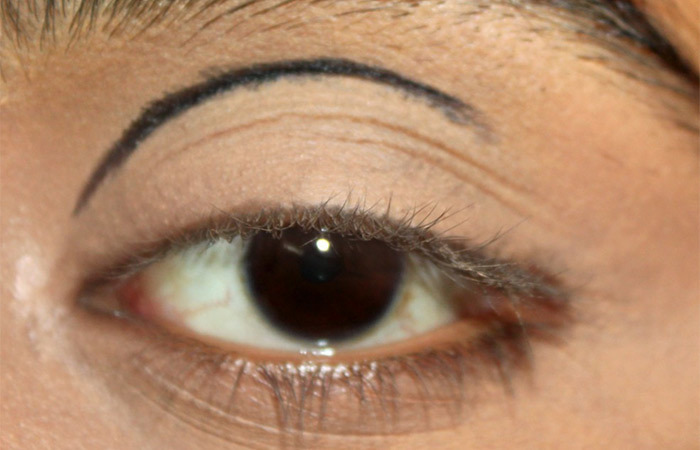 Draw the line completely till the top outer corner of the eyes, and start dropping it slightly. 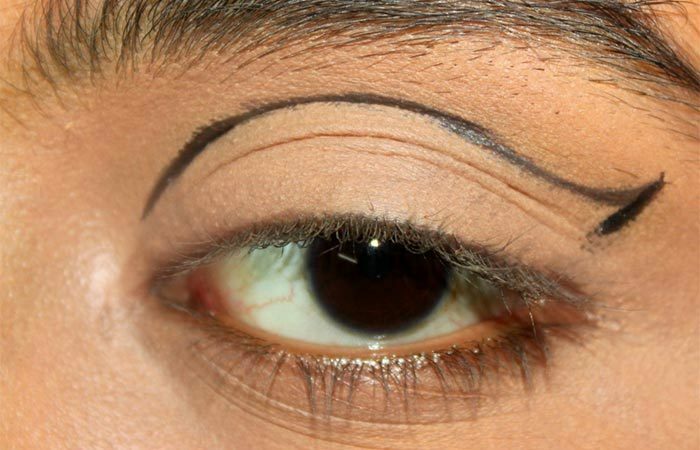 To offer an angle like look, draw a winged eyeline. This will lend a nice dramatic definition to your eye shape. 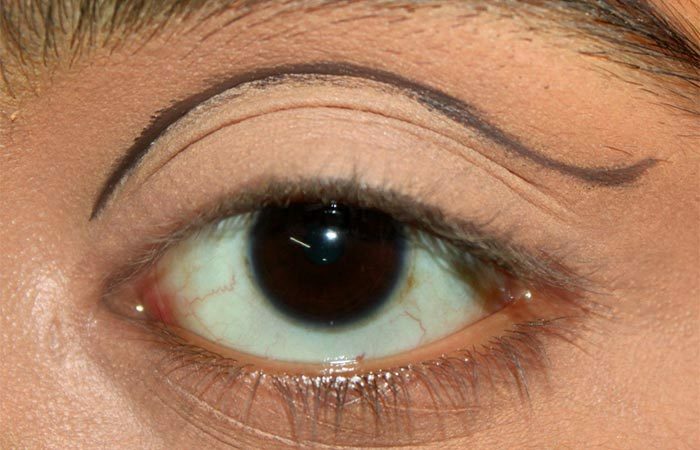 Then, bring the line downward gently by creating shorter and smaller strokes with a steady hand, and connect the line to the outermost corner of your upper lash line. Place the little finger on your cheek area to make your hand sturdy and to avoid mistakes. Now, pull in the eyeliner inward and gently make small and shorter blending strokes to create a soft transition of the eye liner. You could use a smudge brush or a pencil brush to achieve this step. 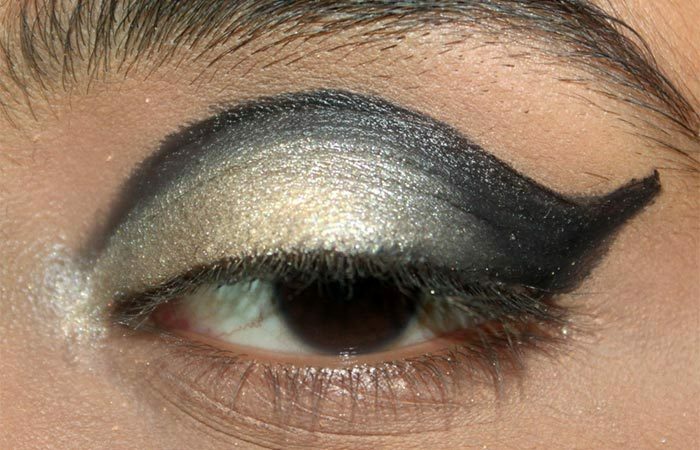 Then, fill in the outermost corner of the eye with the same kajal to create a smokey effect for the Arabic eye makeup. Apply a light golden colored shimmery eye shadow to the center of the eyelid. You can tweak this eyeshadow according to your preference. You can choose either a blue, green or purple eyeshadow. Pat the eyeshadow, and avoid blending as we would want to create a brighter intensity. 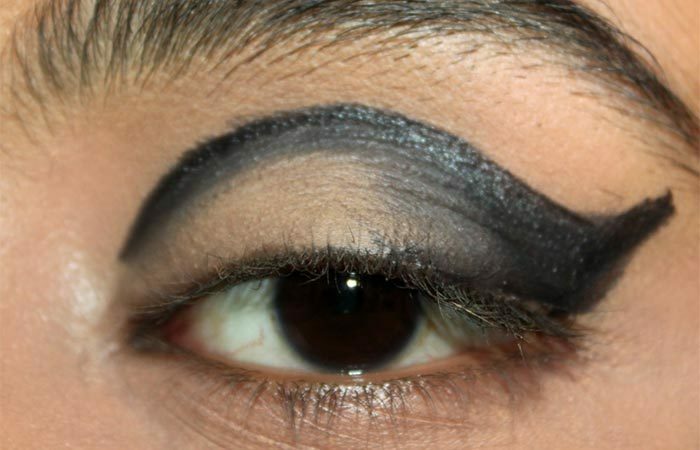 Apply a matte black eyeshadow over the areas where the kajal was applied to set it and to avoid creasing. Then, use a small pointed blending brush, and blend the gold and matte black eyeshadows. You could stop the eye makeup here, if you would like to keep the look less dramatic. But, if you love sporting deep, intense eye looks, go ahead and follow the next step! Apply a deep teal color eyeshadow over the center of your lid by creating a triangular shape to add dimension to the moving lid of the eye area. 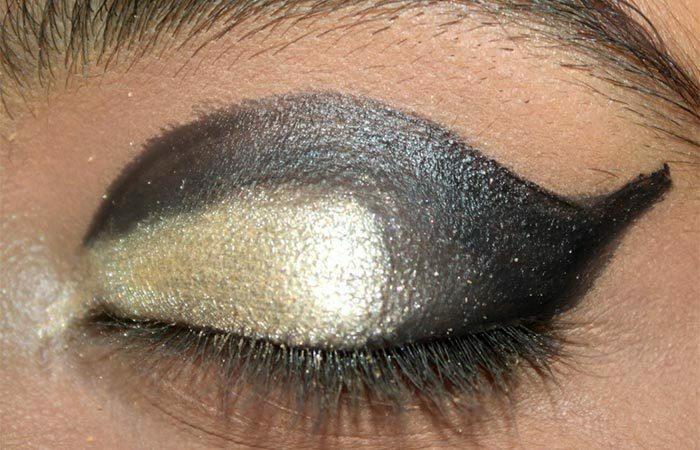 Blend it softly with the gold and black eye shadow, using a blending brush. 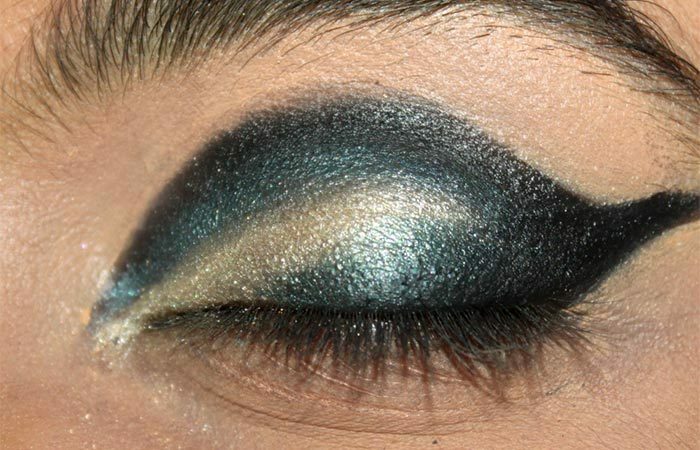 Apply the same dark teal color eyeshadow to the lower lash line. Then, apply mascara and line your eyes to complete the look. You are done! 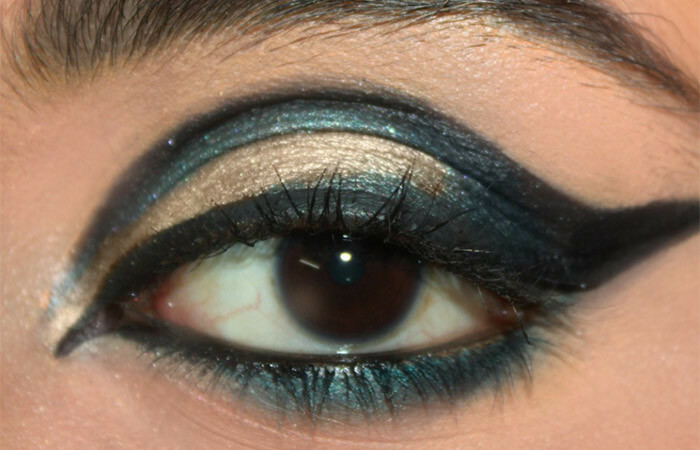 This Arabic eye makeup is very bold and dramatic. If you wish to go for a lighter look, shift the color from black to brown. Try something different and wow the crowd! Do try it and let us know.